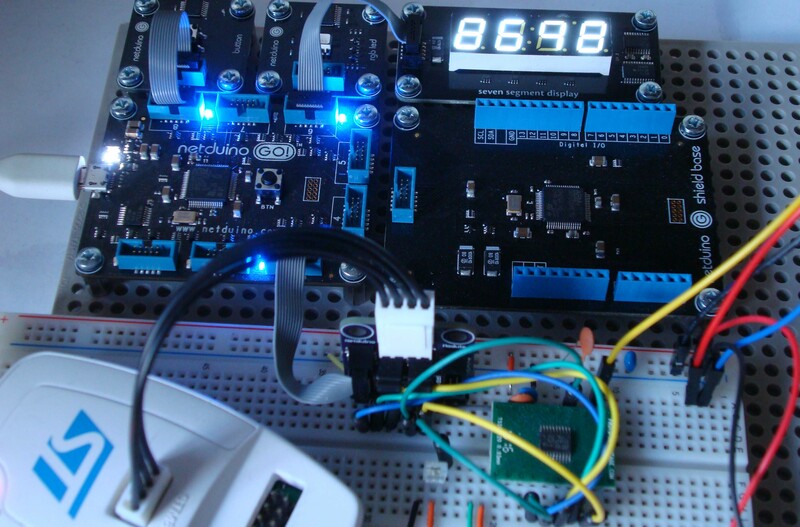 This post continues the low level use of the STM8S registers and shows you how to configure the STM8S system clock. In particular we will configure the system clock to use the internal high speed clock. External clock (1-24 MHz) which can be either an external crystal or user supplied clock. We will be using the internal oscillator as this will be satisfactory for our purposes. An external clock may be more accurate but for most of the work I am doing I am happy to sacrifice the accuracy for the lower component count and greater simplicity of my designs. At start up, the STM8S will be using HSI with a prescalar to bring the initial clock speed down to 2MHz. We will be resetting the clock prescalar to allow the chip to run at the full 16MHz. The description of the clock registers start around page 89 of the STM8S Reference Manual. In this article we will run through the registers concentrating on the values we will be setting. For a fuller description you should refer to the STM8S Reference Manual. The only bits we will really be interested in for this example bits 1 and 0, this allows us to select the HSI and see if it is ready. REGAH Control the actions of the internal voltage regulator when the chip enters Active-halt mode. LSIRDY Set by hardware, this bit determines if the LSI is stabilised and ready. 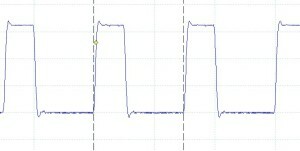 0 indicates the oscillator is not ready, 1 indicates it is stable. LSIEN Set and cleared by the user program, this bit determines if the LSI has been selected as the clock source for the chip. This can also be set by hardware to indicate that the LSI is required. HSIRDY Set and reset by hardware, this bit determines if the HSI is stable and ready for use. HSIEN Set and cleared by the user program, this bit determines if the HSI has been selected as the clock source for the chip. This can also be set by hardware to indicate that the HSI is required. 0 indicates HSI is not selected, 1 indicates HSI is selected. 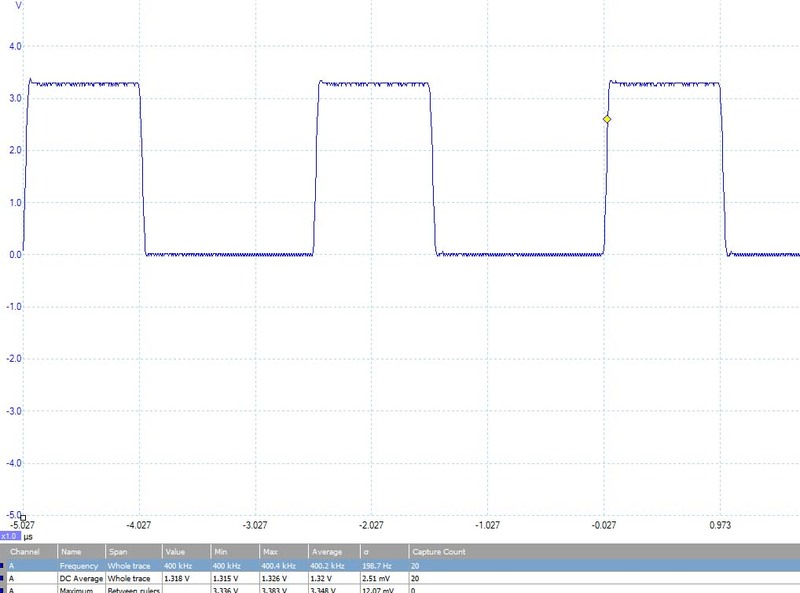 Our example here will be resetting the clock source on the STM8S chip to use the internal oscillator using HSIEN and using the HSIRDY bit to determine when the clock has been setup and is stable. This register is used to provide information about the state of the external clock. We will not be using this register for anything other than resetting the register to the power on state. HSERDY External high speed clock state, 0 = not ready, 1 = ready. This register is set and cleared by hardware and indicates which clock source is currently selected as the master clock source. This register is written to by the user program and is used to select the master clock source. The register cannot be written to whilst a clock source switch is on-going. You can test for the switch using the SWBSY in the CLK_SWCR register. The Clock Switch Control Register is used to control how and when the clock switch is performed. SWBSY This bit indicates if a clock switch is in progress, 1 = clock switch is on-going, 0 indicates that no switch is in progress. This bit is set and cleared by hardware but can also be cleared in software. Clearing this bit resets the clock switch process. SWEN Writing a 1 into this bit starts the clock switching process. SWIEN Enable (1) or disable (0) an interrupt to be generated when a clock switch takes place. In our case we will be using this register to start the clock switch process. The system clock can be divided down to allow for lower clock frequencies to be used. This register allows for the HSI prescalar (divider) and the CPU prescalar to be set. In this case we will want the CPU to be running at full speed and so no prescalars will be applied to either the master clock or the HSI. These two registers enable (set to 1 and disable (set to 0) the clocks used to control the peripherals used in the application. I have fallen foul of these values a few times. If you set these registers or zero then you will turn off the peripheral clocks. This has the effect of turning off the feature you may be trying to use. If in doubt set both of these registers to 0xff. You can always refine the values later by restricting the clock signals to only those which you are using. Enabling the service will use the frequency of the master clock. Disabling the clock to the service will turn it off. The <iosstm8s103f3.h> file does not contain definitions for these bits, you need to define your own constants for these. I have recently taken to just turning them all on as I’m not too worried about the power requirements for the applications I am working on. We will not be using this register in this example apart for setting the default power on value. Please see the STM8S Reference Manual for more information. We will not be using this register in this example apart for setting the default power on value. Please see the STM8S Reference Manual or future examples for more information. As previously mentioned, this example will simply set the system clock to the maximum speed the HSI can deliver. We will then toggle a GPIO pin and hook this up to a scope to get an idea of the output. We will never see the full 16MHz clock speed of the HSI but we should be able to see that the output frequency changes when we change the clock dividers. So first thing, let’s get the system set up and running at the full 16 MHz and see what we the scope produces. PD_ODR_ODR4 = 1;    // Turn Port D, Pin 4 on. PD_ODR_ODR4 = 0;    // Turn Port D, Pin 4 off. 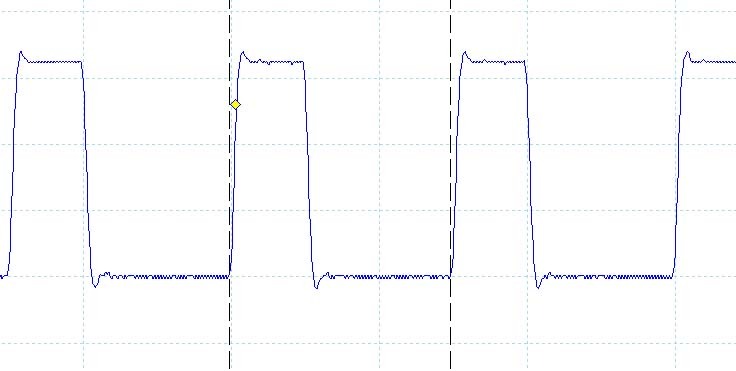 GPIO Output when the System Clock is set to HSI with no Divider. The frequency of the out was 2.693Mhz. CLK_CKDIVR_HSIDEV = 1;				//	Set the HSI divider to 2. 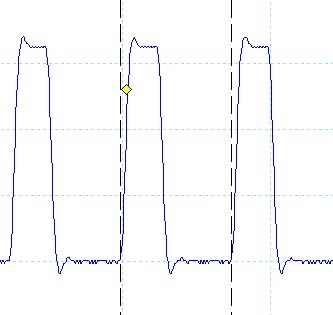 This looks remarkably like the trace above but the oscilloscope shows that the frequency of the signal is now 1.335MHz, or approximately half of the frequency of the first trace. The full project for this article can be downloaded from here. This code has been tested with my reference platform, the Variable Labs Protomodule and the STM8S Discovery board. 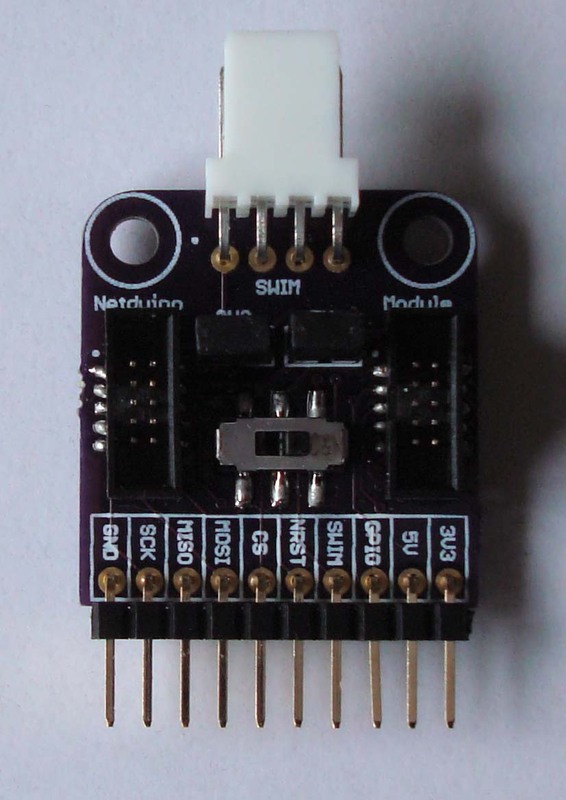 Komodex Labs recently released a couple of new modules for the Netduino GO! platform. The first is a seven segment display module and as we will see later this can be used to show sensor data. The second module is a breakout module for the GO! bus and this is probably more interesting to module developers. As the postman was kind to me and managed to get these modules to me this week I thought I’d hook them up to the light sensor I have been playing with to see what they can do. The project uses a TSL235R sensor which converts the current ambient light level into a square wave with 50% duty cycle. The STM8S periodically reads the frequency of the signal generated by the sensor. This value is then made available to the Netduino GO! via the GO! Bus. This project is going to read the value from the STM8S and display it on the seven segment display. The value is a 16-bit value and so can range from 0 to 65535 so we will be showing the value in hex. The seven segment display is a nice little module very professionally finished. It feels a solid – sort of odd to say that about a module. I was kind of surprised by the weight but then I have only been working with small modules so far. I’d write more but I think the module is best described my Matt’s blog post. This shows some photos of the module along with a description of the API used to control it. This is a handy little module which only had a short production run. I was lucky enough to have ordered one before stock ran out. The module is aimed at module developers. It has a couple of sockets for module cables along with some handy breakout points. The idea is simple, you connect your Netduino GO! to one side of the breakout board and your module to the other side of the breakout board. You can then hook up test equipment (scope / logic analyser etc.) to a row of headers on the board. This allows you to debug your module by snooping on the data going down the GO! Bus. An alternative configuration and one I am using for development on breadboard, is to connect the breakout module to breadboard with the Netduino GO! connected to one side of the breakout board. This allows you to feed the GO! Bus signals into your circuit whilst at the prototype stage. The breakout also has a lovely feature in that you can connect the ST-LInk/V2 module to the board and at the flick of a switch you can disconnect the SWIM/NRST signals from the Netduino GO! and connect them to the ST-Link/V2 instead. This allows you to re-program the STM8S on the fly without having to modify your circuit – NEAT ! For more information about this module I’d head over to Matt’s blog post. Connecting the Seven Digit Module up to the go was easy, it simply needed a standard 5cm GO! Bus cable and that’s it. The Breakout module was a little more difficult as it had to be hooked into an existing prototype circuit. From the Netduino side it was easy, just another 5cm GO! Bus cable. 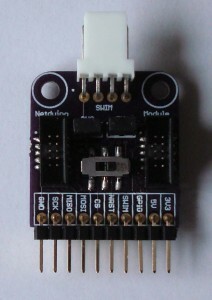 The ST-Link/V2 connection was also easy as the module has a connector already on the board and it is designed to ensure that the connection can only be made one way. The only complication was then ensuring that the connections between the GO! Bus and the prototype circuit were correct. Adding this module has in fact made my prototype circuit a little cleaner. The Seven Segment Module is supplied with a set of drivers in the form of an executable. The drivers can be found on the Komodex Labs web site. Installation was quick, simple and painless. Komodex Labs also provide the source code for the drivers along with a sample application. This is a separate download and as you will see later, this came in handy. As you would expect, the breakout module does not require any drivers as there is no interaction between the module and the PC. The API provided with the module is comprehensive but in this case we are going to use only a small part of it. We need to display a hex representation of a 16-bit number. The above shows the module being instantiated and the display value set to 0. 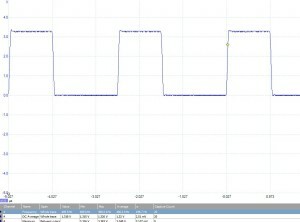 The line short diff = module.GetReading(); obtains a reading from the sensor module which I am prototyping. This value could come from any sensor or from any source / calculation. Hitting F5 deployed the code to the Netduino GO! and values quickly started appearing on the display. Success! I’m getting some unexpected output. Every now and then the module displays a number with some spaces in place of digits. Hmmmmm… what is going on! Time for a quick test program. I know that the module works OK as the test projects ran fine. Adding a Debug.Print of the output variable gave me a clue. There was a pattern. Any numbers with the digit 9 in them showed a space instead of a digit. A quick test program showed that displaying 2929 where the variable of type int displayed the number correctly. Doing the same where the value was stored in a string showed any digit except the digit 9, these were replaced with spaces. Now we know where the problem is. As noted earlier, Komodex Labs supply the source code for the drivers. So opening this project and some poking around the code for the display resulted in the problem being found. A quick modification to the source, recompile and then reference the newly compiled DLL in my code and Success ! Edit: Komodex labs have confirmed that the driver has been patched and as of 27/07/2012 the driver download contains the fix for the problem noted. If you have been following this blog for a while you will be aware that I have recently changed the way I write code for the STM8S from using the STD Peripheral Library to using direct register access. This has required that I go back to basics learning a new way to perform tasks I had only just mastered. The Way of the Register posts will show you have to control the STM8 using register access. This first post will look at a simple task, controlling GPIO lines. The aim of this first exercise is to simply toggle one of the GPIO lines. The following sections provide a brief description of the registers. For more information you should consult RM0016 – STM8S Reference Manual. This register determines which or the GPIO pins are outputs and which are inputs. A value of one in a bit sets a port line to output and zero sets the port line to input. You can set the value of the whole register or each individual bit in the register. This sets bits 0-3 inclusive of port D to output whilst bit 4-7 are inputs. In our case, we need the output pin to operate in Push-Pull mode and as we do not know the final speed of the output signal we will set this to the maximum, 10 MHz. As with the data direction register, each bit in the registers maps to a specific GPIO on each port. In the case of these registers the bits are labelled C10-C17 (for Control Register 1) and C20-C27 (for control Register 2). The format appears to be CRB, where C stands for Control Register; R is an integer representing the register number and B is an integer representing the bit to be set. Now we have the theory in place lets put together a simple application which uses it. The following code sets up port D to have pin 4 configured as an output operating to 10 MHz. The main program loop then simply keeps flipping the bit. The result should be a square wave signal. 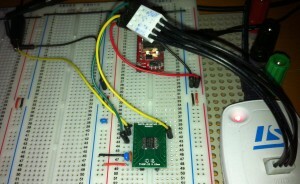 PD_CR2_C24 = 1;         //  Pin can run upto 10 MHz. //  Now lets toggle to IO line. 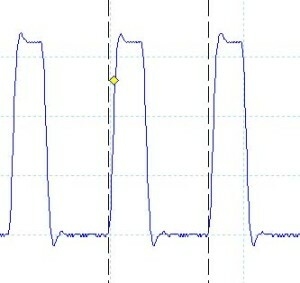 As you can see, we have a square wave. Note that the wave is not symmetrical. This is due to the branch instruction being executed in the while loop to go back to the start of the loop. Here is the IAR project and source code for this post. This code has been tested on my reference platform, Variable Lab Protomodule and the STM8S Discovery board.